Opinion on the Admiral Gorshkov ship have been mixed. Navy officers say carbon fiber is useless, since it is weaker than vessel-grade steel; they worry that its superstructures could disintegrate in extreme northern conditions. Source: ITAR-TASS. The Russian-built Admiral Gorshkov class stealth frigate is the first large naval vessel to be made out of carbon fiber. While there are questions regarding the performance and durability of the composite material, the frigate is set to undergo trials in the Barents Sea this November. The first large naval ship to be built with carbon fiber will start trials in the Barents Sea no later than the end of November. The Admiral Gorshkov frigate is the lead ship of Project 22350. Following the trials, the frigate will join the 14th ASW Brigade of Russia’s Northern Fleet, a source at Navy Command told Izvestia. The frigate has been built using stealth technology, with superstructures made entirely of composite materials that absorb or semi-conduct radio waves to ensure invisibility on radars. “This is the first large ship to be fully designed and built in Russia since 1987 – and this includes St. Petersburg’s Severnaya Verf shipyard. Project 22350 stealth frigates will replace large ASW ships code-named Udaloy by NATO,” an officer at Navy Command said. Opinions on the ship have been mixed. Navy officers say carbon fiber is useless, since it is weaker than vessel-grade steel; they worry that its superstructures could disintegrate in extreme northern conditions with strong winds, low temperatures, and frequent storms. In addition, the superstructure is subject to extreme thermal pressure during anti-ship and anti-aircraft missile launches. Severnaya Verf, on the other hand, believes carbon fiber surpasses steel in terms of physical parameters. The shipyard’s representatives told Izvestia that tests of the superstructure and its components have demonstrated high rigidity and resilience to thermal impact. The Admiral Gorshkov was the first ship to receive not only a stealth superstructure but also the latest combined turbine propulsion system. As a result, the vessel is more efficient and delivers superior acceleration capabilities. The frigate is additionally equipped with a host of modern electronics not found in existing ships; this, however, is a strength and a weakness, since there is a lack of trained personnel. A Navy Command representative and several Northern Fleet officers have stated that it would be impossible to form a crew without extended training on the ground. Vladimir Komoedov , the chairman of the State Duma Defense Committee and former commander of the Black Sea Fleet, maintains that there is nothing to fear from composite materials. “Recently, I visited a factory that makes carbon fiber nozzles for space rockets. It is wonderfully resilient to high temperatures and dynamic loads. If carbon fiber provides stealth, then the ship needs it. In any case, the introduction of a new unit to the Navy is good news,” Komoedov told Izvestia. Vladimir Scherbakov, the editor-in-chief of Vzlyot magazine, believes that it remains to be seen how carbon fiber will perform real-life conditions – particularly in combat situations. “Composite materials are used everywhere these days. Individual ship parts have been tested on the ground, and the calculations look excellent on paper. But this already happened with aluminum in the1980s – the Falklands war demonstrated that aluminum ships are highly combustible. So many fleets have abandoned aluminum superstructures as a result,” Scherbakov said. Military historian Dmitry Boltenkov criticized the carbon fiber frigate from another angle. “Should a frigate with a displacement of just 4,500 tons be named after Admiral Sergei Gorshkov, who did a lot for the Navy? A 45,000-ton aircraft carrier used to bear his name (it is now India’s Vikramaditya). The name Admiral Gorshkov would be more fitting for a Borei-class submarine,” said Boltenkov. 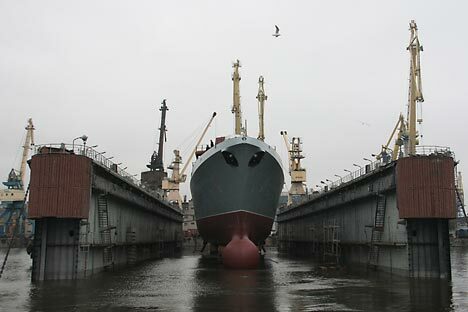 The Admiral Gorshkov stealth frigate was laid down in Severnaya Verf in February 2006 and floated out of the launch dock in October 2010. It is equipped with a 130-mm gun mount, 16 anti-ship Onyx missiles, and 16 anti-submarine Kalibr-NKE missiles. There is also a surface-to-air Polimer-Redut defense system and a Ka-27 helicopter for ASW missions.